Iron Man: What's the hold up, Rhodey? Hurry up and join the Academy, so I can make you the best armor ever. 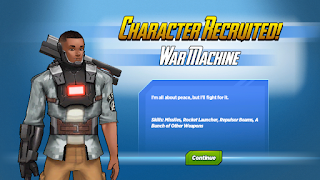 War Machine: I'm ready to join! I'm just not ready to believe you'd ever let my armor be better than yours. Iron Man: Fine. Maybe not better, but bigger. Like, way bigger. I wanna turn you into an indestructible, walking tank with enough firepower to bust any monster on the planet. War Machine: I'm here, Tony! What should we do first? Iron Man: Go to the Club? See if Black Widow is there? Have you nonchalantly tell her what a strong and thoughtful friend I am? Iron Man: I knew you wanted to be my sidekick! War Machine: You always need my help. War Machine: And there's a lot of crazy pictures on there. I saw 'em once by accident, and still can't get it out of my head. Iron Man: Thanks, Rhodey. I owe you. War Machine: Make me my own flying suit of armor, and we'll call it even. 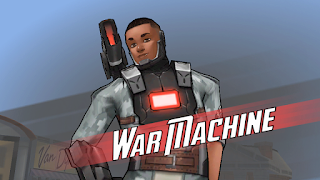 War Machine: Really?! I was just kidding. Iron Man: I know. You aren't that funny. This suit might be your only shot at being interesting. Iron Man: What's gonna be your Super Hero name? Iron Man: I'd go with that. War Machine: Are you making it grey so you'll be flashier? Iron Man: You like grey. I like flashy. War Machine: Looks like I'm gonna be way tougher. Iron Man: I'm fine with being faster and more handsome. War Machine: I'd rather be smarter and stronger. Iron Man: Whatever you say, Smash Blastman. War Machine: Wanna go flying? Iron Man: Don't you ever get full from eating all of my dust? War Machine: Don't you ever get sick of hearing yourself talk? Iron Man: No. Is that even a thing? 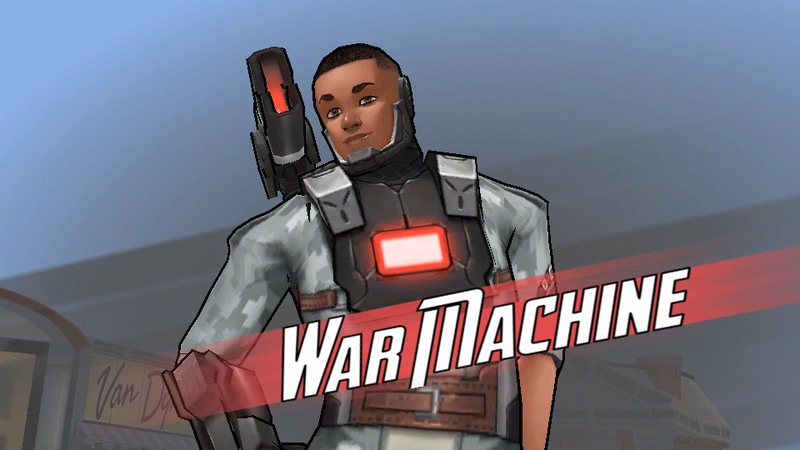 War Machine: Ha! Tell me you didn't just get owned by my flying prowess! War Machine: Don't be a sore loser, Tony. 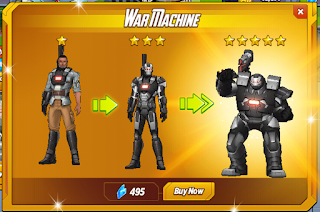 War Machine: You calling me a knockoff? Iron Man: More like my sidekick. War Machine: We created a distraction so Enchantress could case a spell to make you think you're naked. Iron Man: Oh, that's what happened. I was wondering why I was suddenly naked. War Machine: But you didn't go inside. Or put on clothes. Or get embarrassed. Iron Man: There's a sudden epidemic of nakedness, and I'm gonna go inside? C'mon Rhodey, you know me better than that. War Machine: Humiliating Tony is hopeless since he's always humiliating himself. I saw we mess with Loki's spellbooks so his magic backfires. Falcon: Cool, I still owe him from the time he redecorated my room like a bird's nest. Enchantress: No, but it was my idea for him to pre-chew all of the food in your fridge. Enchantress: I'm over it. I was never second to anyone, and you two will always be losers. Falcon: I think I;m done too. I'd feel guilty pranking Cap anyway. Nick Fury: We got reports of some Hydra Enforcers wrecking the city. Can you handle it? War Machine: You sure you want me? Nick Fury: You're one of my best and bravest. Should I get somebody else? War Machine: I'll take care of it. Nick Fury: Good. And take the Quinjet. I want these snakes to learn that the sight of that plane means a beatdown is coming. Nick Fury: Nice work. I'm gonna use that footage for away-mission instruction. War Machine: Thank you, sir. Nick Fury: I know you guys get labeled as leaders and sidekicks and villains and whatever else, but always remember that you're all just annoying rookies to me. What do you think of War Machine? Have you invited him to your Academy? Any favourite tasks?